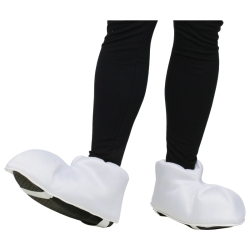 Over sized white padded foot covers to create the effect of simply drawn cartoon feet. These shoe covers are perfect for any cartoon character or paired up with our food, fruit, or vegetable costumes. The cartoon feet foot covers are colored as pictured and feature elastic straps that run across the bottom allowing them to be worn over almost any shoe with a flat sole.